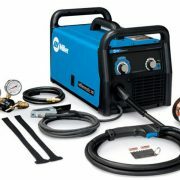 If you are searching for a portable flux-core machine that operates without gas the Forney 299 MIG Welder is a great choice. 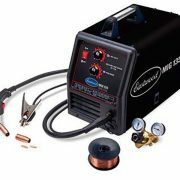 For beginner welders the machine is easy to use, just plug it in and you’re ready to start welding. No messing around with shielding gas. 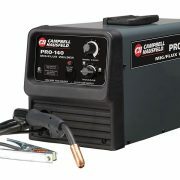 It’s so simple to set up that you will up and running and welding your first part in 5 minutes. 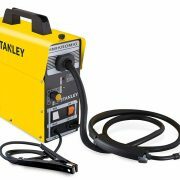 With an output power rating or 125 AMPS the Forney 299 MIG Welder has a fairly wide operating range for welders in this class. 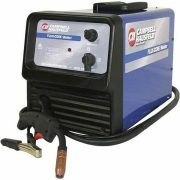 You can weld thin 24-gauge sheet metal, ¼” Steel Plate and anything in between. While the manufacturer has rated it for ¼” thick material, I would stick with 1/8” or less for full penetration. If you need to weld a lot of ¼” plate I would opt for a larger machine. If you plan to power this model using a portable generator, you will need a generator that provides 120 volts at 20 AMPs. While this isn’t a very big generator, anything smaller would be too small to power the welder adequately. The package comes with Tweco Consumables to get you started. The machine comes with a 6 FT welding lead and ground clamp. While the Forney machines are pretty reliable, the factory 6-month warranty is shorter than some of its competitors but I wouldn’t let it scare me. The duty cycle is also fairly low, but as long as you are doing minor repairs and not performing any production work you will be just fine. It only has 2 heat settings so you can’t fine tune the machine for perfect operation. This can be overcome to some degree with a little operator finesse. 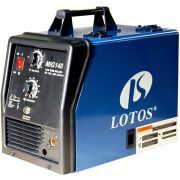 Many of the more expensive machines have an infinitely variable control for precision welding. 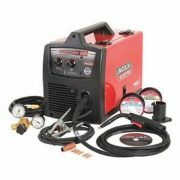 This is a versatile machine with an entry-level price tag that is perfect for the novice welder. Since it is a 115 Volt machine you won’t need any special power outlets. With a heavy duty extension cord you can hand carry the machine to the repair site in your yard. 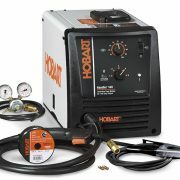 So as long as you are a hobbyist and don’t plan on doing any production work the Forney 299 MIG Welder will be just fine.